The Raging Inferno, formerly know as the Southern Cape. Day 4. The fire has consumed those of us living in its ever-present shadow. I struggle to think of much else. The degree of destruction is beginning to feel like natural disasters we hear about in the rest of the world but rarely experience in our beautiful country. We are no longer exempt. Close on 5000 hectares of Cape Fynbos has now burned. It is devastating. The fact that no one has been seriously injured shows the incredible people we have managing this fire and looking after the communities that are being circled in flames. The tragedy lies in the houses that have burned to the ground, the destruction of our neatly tarred roads, the ‘humanisation’ of this beautiful, natural environment. The heartache however, lies in the devastation to the animal and plant kingdom, the thousands of traumatised and lifeless animals engulfed in smoke and flames. I have felt overwhelmed on numerous occasions in the last few days when looking at my surroundings and seeing the extent of the damage. I think a large part of that came from the realisation that this is possible. That from a tiny flame can come so much destruction. It’s almost unbelievable. If I am honest though, a lot of that sadness comes from the knowledge that my countryside isn’t as beautiful as it is expected to be, as it ordinarily is.With parents who are avid nature lovers, I grew up in the knowledge that fynbos is a plant type that thrives after fire. The Cape Floral Kingdom is a uniquely adapted environment, which actually needs burning. The burning is a purification of the plants and a redistribution of nutrients to the soil. Seeds and bulbs lying long dormant in the ground are given sunlight and room to grow while larger bushes are prevented from taking over and growing too abundantly in an area. This is the reality of the incredible vegetation that surrounds us. What we are witnessing is a ‘resetting’ of the biome. All this knowledge doesn’t make the destruction any less severe however. In an interesting conversation last night with a friend, we were discussing the obliteration of our landscape. I was sharing the weight of what I felt was a huge knock to Cape Town. She shared what she thought was a cleansing and a rebirth not only to the vegetation, but people’s spirits too. This fire, she said, may not be what we as people want to see, but it is what the vegetation needs. As difficult as it is to admit, our pain in what we are witnessing may be substantially more selfish than we would like to admit. We as a civilisation have positioned ourselves slap-bang in the middle of an area, which evolved over millennia, around the need to ignite, not regularly, but every 10 – 15 years. This is however, far more often than we would like. Part of the reason so many of us live here is because of the beauty, how could it not sadden us to look around and see a post-apocalyptic wasteland in front of us, we would not be human if we did not feel some sadness at the loss. And I think that’s precisely what was meant by cleansing people’s spirits. A large portion of the Cape Town population has rallied around the fire fighters, pilots and rescue crews. There has been more support shown for these brave men and women than I think I have ever witnessed in our country. We have looked, as a people, beyond our own selves and seen a greater need. There is nothing more cleansing to the soul than that. It has breathed new life into us all. It is impossible to ignore the heartache the natural world has experienced, nor should we try. What I am suggesting is that we look at this ‘tragedy’ with fresh eyes. Eyes that can see forward to the new growth of plants, to bulbs already stirring under the soil from the heat and smoke from the flames, getting ready to sprout flowers not that different in colour to the flames themselves. The rebirth of vegetation along with new life currently burrowed under the soil, will stir our hearts when we see it. Our mountain may not be much to behold right now, but in time, it will be what it once was. Let’s look forward with anticipation to those first precious buds pushing through the burnt crust of earth. My hope is that along with the beauty of our floral kingdom, will come a beauty of the human spirit, a burst of new life into the community in ways we have not done before. Let’s keep looking beyond ourselves, there are Fire Lillies among us. 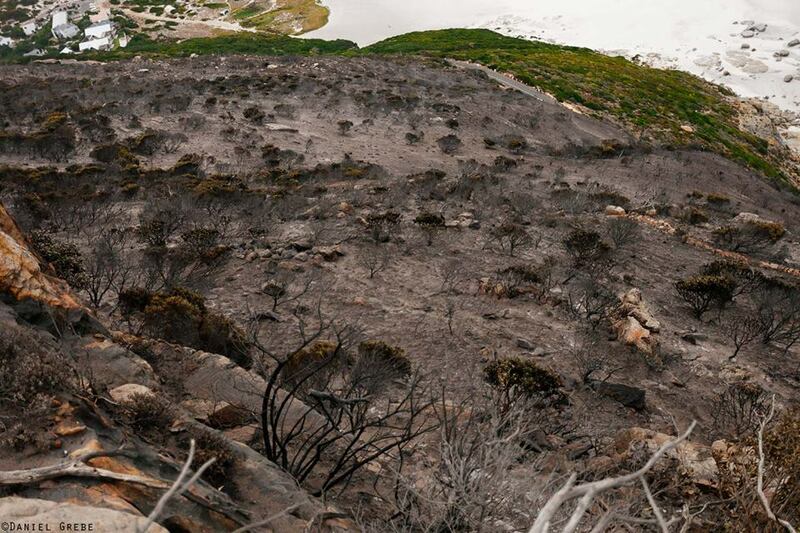 For further reading on fynbos’ need for fire, see Out of the ashes: Notes on the March 2015 Cape Town Wildfire.